It’s not KFC (a lesser man might have added, “thank God”). But in the greater Los Angeles area, Zankou Chicken may well be more celebrated than the fast-food giant. Indeed, there’s a road map on Zankou’s walls showing all eight of the scattered locations of this mini empire. If anything, you could call it fast Middle-Eastern chicken. There are rotating spits of shawarma chicken, grilled kabob plates and wraps. But the signature dish is fall-off-the-bone rotisserie chicken, available in half ($10.50) or quarter ($8, white or dark) sizes. Each plate comes with creamy hummus, pickled veggies, a couple of pitas for scooping and a little dish of Zankou’s not-on-a-first-date garlic sauce. I rarely frequent fast-food chains of any size, especially in generic, fairly sterile surroundings. But when the food’s this good, quick and affordable, I’m happy to make an exception. This entry was posted in California, Los Angeles, Middle-Eastern Food, road food, road trip, Road trip food and tagged Los Angeles restaurants on August 1, 2016 by bcorbett907. Fantastic Falafels at Thirsty Camel in Nanaimo, B.C. Customers sometimes tell Ilan Goldenblatt about the best falafels they’ve ever eaten… elsewhere. 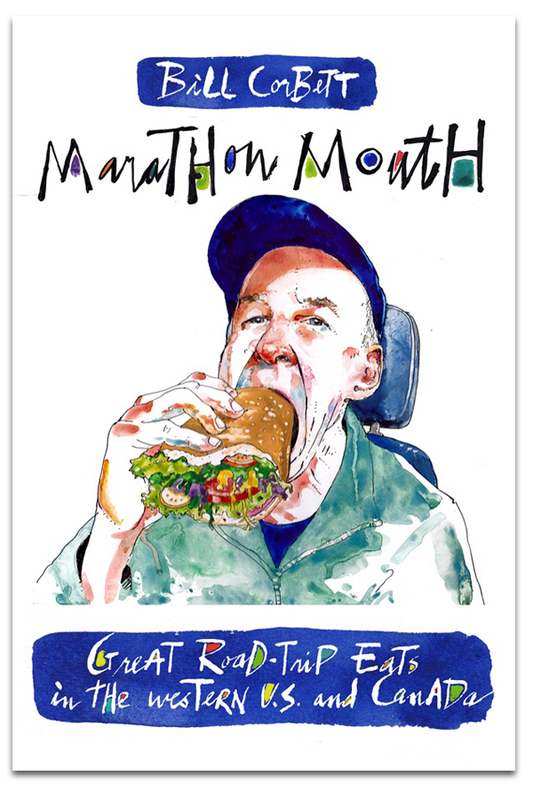 But once they’ve sunk their teeth into the tender falafel pitas he painstakingly makes from scratch at little The Thirsty Camel Cafe, in Nanaimo, B.C., they invariably revise their opinions. It starts with the oil. Most falafel-frying joints change their cooking oil every now and then, perhaps filtering it more frequently. But Ilan begins each day with new oil. He wants it this fresh because his chickpea-based balls are only formed (with a custom, Israeli-made device) when ordered. Into the virgin oil they are briefly plunged, emerging slightly green, from the parsley and cilantro, and with just enough surface crunch to mask the silky tenderness inside. No dry, stale falafel balls these. No siree. 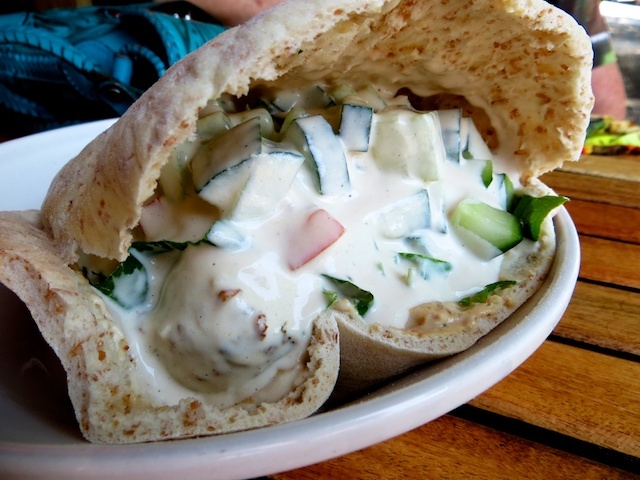 The six warm falafel balls are then stuffed into a thick pita fold, along with cool cucumber, house-made tahini and a sauce that’s got a camel’s kick if you think medium heat is just that. 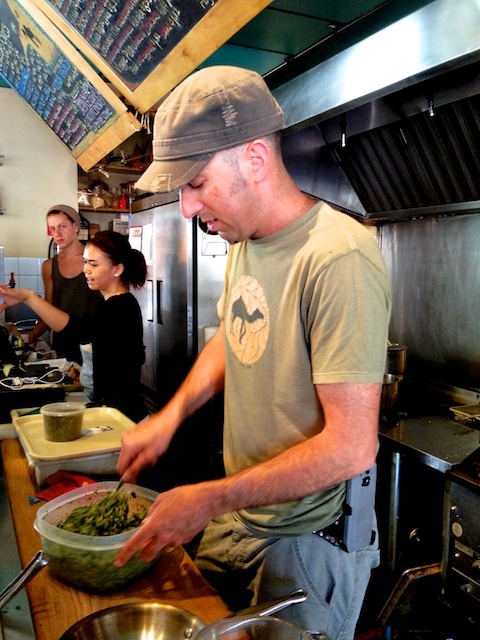 Ilan and his staff have been pouring love into their falafels and other Middle Eastern fare for 10 years. You can taste it with every mouthful. 14 Victoria Crescent, Nanaimo, B.C. If you have a hankering for sourdough bread, best make a beeline for Bodhi’s Artisan Bakery, on a leafy Nanaimo street. They make a good half-dozen varieties of sourdough, including a garlic asiago and an olive. 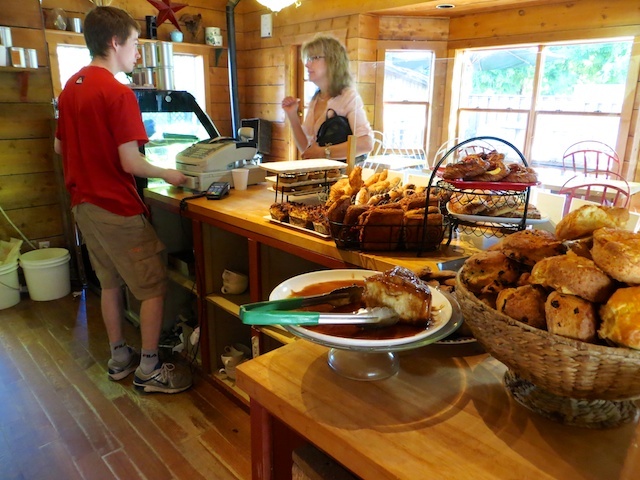 They also produce fine cheese scones, pumpkin muffins and dripping cinnamon buns, if you’d like a sumptuous treat to go with an excellent espresso, crafted from Cowichan Valley Peaks Coffee beans. It’s all best enjoyed on a shady patio, where a half hour slips by as smoothly as the coffee goes down. 5299 Rutherford Road, Nanaimo, B.C. 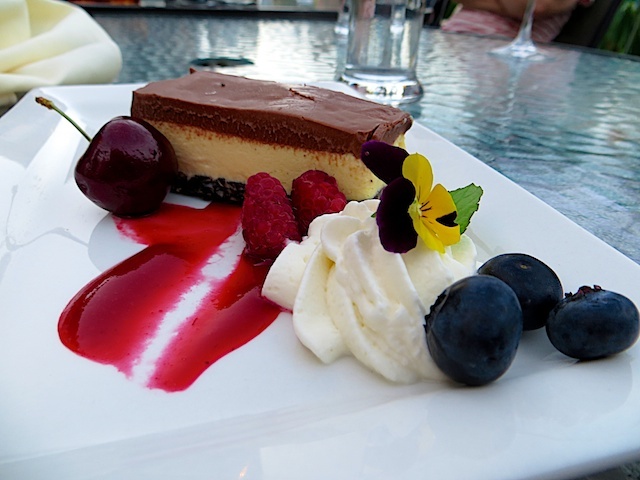 This entry was posted in Bakeries, British Columbia, Middle-Eastern Food, Nanaimo, Vancouver Island and tagged Nanaimo B.C. on August 11, 2014 by bcorbett907.